I wish all my readers a happy July 4th holiday. A Massachusetts judge has ruled that an unusual class action lawsuit against Philip Morris may proceed. The judge's ruling certified the class, but it does not relate to whether the legal basis for the suit is sound. The ruling means that the judge has found that the legal issues involved are common to all plaintiffs, and thus the case can proceed as a class action suit. The class consists of all Massachusetts adults ages 50 and older who smoked Marlboros at an intensity of at least one pack per day for at least 20 years. The case is unusual, because unlike most cases, it does not involve the pursuit of damages for smokers who have already suffered diseases or death that are allegedly due to their smoking. Instead, it seeks costs for medical monitoring of "healthy" smokers for early detection of lung cancer. Specifically, the suit seeks payment for annual chest CT scans. The reasoning behind this request is that the plaintiffs allege that these CT scans will detect lung cancer early, at a more treatable stage, and thus will save lives. According to the article in the Boston Globe: "The plaintiffs claim that if they do eventually develop the disease, the screenings will increase their likelihood of survival almost six-fold. No class member would be eligible if they have been diagnosed with lung cancer or are under a doctor's care for suspected lung cancer, and all must have smoked Marlboro cigarettes within Massachusetts, she wrote. Marlboro cigarettes are designated because that is the brand the two plaintiffs smoked. Richard Daynard, a law professor at Northeastern University and chair of its Tobacco Products Liability Project, said that if the plaintiffs win, the case will likely spawn dozens of similar suits in federal courts across the country. 'It's a tremendously important case,' he said. The case before Gertner, he added, will probably turn on whether the chest scans save lives. A growing body of evidence, he said, indicates that they do." Unfortunately, there is no scientific evidence at present demonstrating that CT scan screening for lung cancer among smokers is effective in saving lives. In contrast, the existing evidence demonstrates that the procedure is inappropriate as a screening test because it has an unacceptably high false positive rate, and that its implementation would certainly lead to morbidity and even mortality among smokers. Why would there be morbidity and mortality among smokers? For two reasons. First, the many false positive results would require further diagnostic testing, some of which involves invasive procedures or surgery. There is a significant level of morbidity and mortality associated with such procedures. In addition, the anxiety produced for thousands of smokers who would be told they may have lung cancer would be substantial. Second, CT scans involve considerably high doses of radiation and exposing a large population of asymptomatic individuals annually to this radiation would actually increase the risk of cancer in the population. While one might argue that these risks are worth taking if the procedure has been shown to save lives, the existing evidence has not demonstrated that this is the case. Therefore, the risk-benefit equation is currently very strongly on the side of risk. And it would be unjustified to require Philip Morris to pay for a screening procedure that poses more potential risk than benefit. Studies are currently underway to evaluate whether CT scanning of smokers for lung cancer could save lives. But until such studies are concluded, the evidence base simply does not support the use of this procedure on a population-basis, as is being proposed in this lawsuit. For this reason, no national medical organization currently recommends the use of CT scan screening. The rest of the story, then, is that the existing scientific evidence does not support the use of CT scans for early detection of lung cancer. The current evidence demonstrates that such a procedure, implemented on a large scale, would undeniably result in a significant amount of morbidity and mortality, but that there is no guarantee that the procedure would save lives. Since the fundamental tenet of medicine is "to do no harm," the existing evidence does not justify the use of CT scans for early detection of lung cancer on a population-basis. Therefore, I believe that the suit should not succeed. According to Food and Drug Administration (FDA) Commissioner Margaret A. Hamburg, candy-flavored cigarettes are a major gateway to youth smoking and the federal ban on flavored cigarettes will therefore reduce the number of youth smokers. In a press release issued by FDA last September - when the flavored cigarette ban went into effect - Hamburg stated: "Almost 90 percent of adult smokers start smoking as teenagers. These flavored cigarettes are a gateway for many children and young adults to become regular smokers. The FDA will utilize regulatory authority to reduce the burden of illness and death caused by tobacco products to enhance our Nation's public health." As recently as this Tuesday, Representative Henry Waxman also asserted that candy-flavored cigarettes are used by the tobacco industry to hook teenagers on cigarettes. He stated: "On the first anniversary of the historic Family Smoking Prevention and Tobacco Control Act, it is important to focus on the crucial protections and benefits the law has provided, and the additional safeguards due to take effect today. The new law gave the Food and Drug Administration (FDA) authority to regulate tobacco products, as well as their advertising and marketing. Using this new authority, FDA banned candy- and fruit-flavored cigarettes, used by the tobacco industry to hook children on tobacco." The public assertions made by the FDA Commissioner, Assistant Secretary for Health and Human Services, and Representative Waxman - a leading proponent of the FDA tobacco law - sound great, but there is just one problem. The rest of the story is that these assertions are untrue. In fact, prior to the implementation of the law, not a single flavored cigarette brand (other than menthol cigarettes) produced by one of the major tobacco companies - including Philip Morris, Reynolds American, or Lorillard - was on the market. And the overall market share of flavored cigarettes among youth smokers was less than 0.1%. The truth is that nearly every youth who is addicted to tobacco smokes one of the major cigarette brands - including Marlboro, Camel, Newport, Kool, Winston, Parliament, and Basic. None of these are flavored cigarettes (again, with the exception of menthol, which I'll get to shortly). The truth is that the predominant gateway to youth smoking is non-flavored cigarettes (excluding menthol). The removal of flavored cigarettes from the market by the FDA will have no impact whatsoever on youth smoking. The only thing that would have had an impact is the removal of the non-flavored cigarettes - like Camels, Marlboros, and Newports - which are smoked by greater than 85% of all youth smokers. In fact, the one flavoring that was exempt - menthol - is the one and only flavoring that is actually used to hook kids. There are literally tens of thousands of kids using menthol-flavored cigarettes, but even prior to the FDA law, there were virtually none using candy-flavored cigarettes that were actually covered by the law. It is well known that I disagree with the views of the FDA, Department of Health and Human Services, and Representative Waxman on the merits of the Family Smoking Prevention and Tobacco Control Act. There is certainly room for alternative opinions on the merits of this new law. However, what I do not believe there is room for is misleading the American public about the scientific facts. It is tantamount to lying to the public to tell us that candy flavored cigarettes are a gateway to youth smoking. It is disingenous, if not an outright lie, to assert that flavored cigarettes are alluring and enticing kids to smoke. It is demonstrably false that the ban on flavored cigarettes will break the cycle of addiction for 3,600 youths a day. It is untruthful to state that candy-flavored cigarettes were being used by the tobacco industry to hook youths. And it is outright false to claim that the ban on candy-flavored cigarettes will lower youth smoking rates, as the law applies to virtually no brands actually smoked by youths. I challenge Dr. Hamburg, Dr. Koh, and Representative Waxman to name the actual cigarette brands - the brands of candy-flavored cigarettes - that they allege were the source of youth addiction to cigarette smoking just prior to the implementation of the flavored cigarette ban in September 2009 and which are no longer being smoked by large numbers of youths as a result of that ban. The only cigarette brands which fall into that category are kreteks (clove-flavored cigarettes), but these products did not make up any substantial portion of the youth cigarette market. I challenge Drs. Hamburg and Koh and Representative Waxman to name any other flavored cigarette brand that was responsible for any significant proportion of youth smoking just prior to the law's implementation last September. If they are unable to name such brands, then clearly their public assertions were false. What is most disturbing to me about the rest of the story is that these reputable health agencies - the Food and Drug Administration and the Department of Health and Human Services - are making false statements to the public, and apparently for purely political reasons: to garner political support for the FDA tobacco law and make it look like this law is more effective than it actually is. I can't tell you how troubling that is to me. Federal agencies should be guided by science and facts, not by politics. Especially in this Administration, which is supposed to pride itself on the reliance on science, rather than politics, in policy making. This is a truly sad and very disappointing let-down for me. But more importantly, it is an unfortunate let-down and disservice to the American people, who I think deserve better. We deserve the truth and unfortunately, we're getting political speak, not the truth. That's perhaps to be expected when it comes from politicians, but it's unacceptable when it comes from federal health officials. Instead of whining about the tobacco companies evading the FDA tobacco law by using colors to denote the brands formerly known as "lights" or "milds," the Campaign for Tobacco-Free Kids should be apologizing to its constituents and to the public for knowingly crafting legislation that would not accomplish its declared purpose. The Campaign for Tobacco-Free Kids, along with the American Heart Association, American Lung Association, and American Cancer Society have pulled one over on the American people by declaring that the legislation that the Campaign crafted in negotiations with Philip Morris would put an end to descriptors relating to "light" or "mild" cigarettes. The Campaign for Tobacco-Free Kids is urging that tobacco companies and retailers not be allowed to tell consumers that the renamed products are the same as the former products. But this is an unconstitutional restriction of free speech. Unless the renamed product is banned, or the descriptor used is in violation of the law because it directly infers that the cigarette is safer, then I'm afraid that the companies are in compliance with the law and the anti-smoking groups are going to have to respect that. Now that's the rest of the story that the anti-smoking groups don't want you to know. In its propaganda supporting the Family Smoking Prevention and Tobacco Control Act, the Campaign suggested that this legislation would "end the tobacco industry's deceptive marketing of "light" and "low-tar" cigarettes." "Goodbye, Marlboro Lights. Hello, Marlboro Gold Pack. "Light" cigarettes are going up in smoke by the end of June, but their names and packaging are getting a colorful makeover. The U.S. Food and Drug Administration says cigarette packs no longer can feature names such as "light," "mild," "medium" or "low," which many smokers wrongly think are less harmful than "full-flavor" cigarettes. Cigarette makers are replacing those words with colors such as gold, silver, blue and orange on brands that make up more than half of the smokes sold across the country. "The nation's largest cigarette company, Philip Morris USA, made more than 150 packaging changes to comply. It also has included inserts in packs and displays at retail locations telling customers to "In the Future, Ask For..." the new name or color of their brand. For example, the company is replacing its Marlboro Light cigarettes with Marlboro Gold Pack; its Marlboro Menthol Milds will be known as Marlboro Menthol Blue Pack. Philip Morris USA is owned by Altria Group Inc., based in Richmond, Va."
"While customers may already see some of the new packaging in stores, calling their smokes by their old names may be a harder habit to break than smoking itself. "I'll ask for Newport Light 100s, and I'll let them decipher it," said 52-year-old Joe McKenna, a teacher and longtime smoker from Pearl River, N.Y., whose brand made by Lorillard Inc. is now known as Newport Menthol Gold. "It's just kind of ridiculous in the sense that you know they're harmful for you." "In anticipation of a ban against using words such as "light" or "mild" on cigarette labels and ads, tobacco companies have lightened package colors to convey the same message, a move the American Lung Association and Rep. Henry Waxman, D-Calif., have attacked as disingenuous. ... As an FDA guidance document notes, many smokers mistakenly believe that cigarettes labeled "light" or "mild" "cause fewer health problems" than others. As for the color changes, "this is a transparent attempt by the tobacco industry to evade the law and mislead consumers," Waxman said Friday." The truth is that Bill Godshall and I predicted, years ago, that exactly this scenario would unfold: the cigarette flavoring ban would have no effect because no cigarettes were actually affected by the ban (menthol cigarettes are exempt) and the "lights" ban would have no effect because cigarette companies would start using coloring to convey the differences between "lights" and other brands. Of course, Philip Morris knew all of this going into its negotiations with the Campaign for Tobacco-Free Kids. So the question is whether the Campaign was simply outsmarted by Philip Morris or whether the Campaign actually knew that this was the case and decided to deliberately mislead its constituents and the public. Either way, the rest of the story is that the Campaign for Tobacco-Free Kids' and other anti-smoking groups' promises about the FDA tobacco legislation were false promises. They were pure propaganda. The Campaign must have known that the cigarette companies would simply rename their "light" cigarette brands and that consumers would continue to associate the new brands with the old "light" brands. Why, then, did they mislead their constituents and the public by asserting that the FDA tobacco law would end the deception of consumers about "light" cigarettes? While Representative Waxman and the anti-smoking groups are complaining that it is the tobacco industry that has played a trick on the American people, it's actually the other way around. It is Waxman and the anti-smoking groups which have deceived the American people and played a dirty trick on us. They told us that their legislation would end the deception of the public regarding light cigarettes. Yet they knew all along that the cigarette companies could easily get around the ban on "light" terminology. In fact, the cigarette companies are doing nothing unlawful. Think about this: they have to rename their brands. They have no choice about that. Otherwise, there would be mass consumer confusion and no one would know what brand was which. So if they have to rename their brands, then whatever name they use to denote a cigarette that was previously a "light" brand, that name will now be associated with the former "light" cigarettes. As Joe the teacher noted insightfully, consumers will most likely continue to ask for "Marlboro Lights" anyway, and retailers will simply inform them of the new brand name. It really doesn't matter what the new name is. No matter what name the tobacco companies had chosen, it would be associated with the old "lights" brand name. Let me make something very clear. Had it been Congress', Waxman's, and the anti-smoking groups intention to end the deception they claim is being caused by "light" cigarettes, then they would have made sure that the legislation they enacted or supported simply removed "light" cigarettes from the market. But the law didn't do that. It specifically chose not to remove these brands from the market, which would have directly handled the problem. Instead, these policy makers and anti-smoking groups pulled off a snow job. They allowed the products to be renamed and to remain on the market. The truth is that no matter what the tobacco companies renamed their products, the anti-smoking groups would have attacked them and accused them of evading and circumventing the law. Philip Morris could have renamed Marlboro Lights as Marlboro Classics, and the anti-smoking groups would have (correctly) noted that everyone knows that Marlboro Classics are really Marlboro Lights. Let's face it. Even without a package onsert, consumers are going to find out that if they want Marlboro Lights, they need to ask for Marlboro Golds, Marlboro Classics, or whatever Philip Morris had decided to use as the new name for Marlboro Lights. All of this hullabaloo over the tobacco companies evading the law is nothing more than an attempt to hide the real deception and evasion that occurred: the massive deception of the public by the anti-smoking groups and policy makers who lied about the FDA tobacco legislation, telling us that it would accomplish things that these groups knew it would not and could not accomplish. On this occasion, it is the anti-smoking groups, not the tobacco companies, which are pulling one over on the American people. The American Cancer Society continues to deceive the American public by telling us that Big Tobacco opposed the FDA tobacco legislation enacted by Congress last year. John Seffrin, the CEO of the American Cancer Society, was quoted in a HealthDay article as stating: "The American Cancer Society, along with the broader public health community, fought the tobacco industry for more than a decade to get this historic legislation passed." The statement is simply not true. The biggest supporter of the FDA tobacco legislation, and a contributor of enormous lobbying expenditures in support of the bill, was none other than Philip Morris, the nation's largest tobacco company. Why does the American Cancer Society have to continue to lie like this? Why are they seemingly incapable of telling the American people the truth: that Philip Morris supported this bill? I find it ironic that one of the main purposes of the legislation was supposedly to end the lies being propagated by Big Tobacco, but that in order to support the legislation, the anti-smoking groups like the American Cancer Society waged a campaign of deception and lies of their own. Unfortunately, the rest of the story is that the campaign of deception continues to this day. Even after accomplishing its goal of passing the FDA legislation, the American Cancer Society is still not capable of telling the American people the truth. Former FDA Commissioner Dr. David Kessler, speaking at a forum on the impact of the FDA tobacco law, urged the Agency to mandate significantly lower levels of nicotine in cigarettes. According to an article in the New York Times, he called for a reduction from the current level of about 10 mg per cigarette to less than 1 mg, which would be a reduction of just over 90%. According to Kessler, mandating this reduction in nicotine levels would bring the nicotine to "non-addictive levels" and would save 200,000 to 300,000 lives a year. The FDA tobacco law does not allow the Agency to eliminate the nicotine in cigarettes. Myth #1. Nicotine is not addictive below 1 mg per cigarette. There is no evidence to support the contention that below 1 mg, nicotine-laden cigarettes cease being addictive. This has never been tested in real-life setting, so there is simply no evidence to support the assertion. This assumption flies in the face of what we know about other addictive drugs. For example, addiction specialists who treat alcoholics do not recommend that they cut the amount of alcohol they consume by 90%. They call for complete abstinence. Anything short of this is going to result in activation of brain receptors that are involved in addiction to alcohol. Even at a level of less than 1 mg, there is almost certainly going to be some uptake of nicotine, and some binding to receptor sites in the brain, resulting in at least some activation of the neurochemical systems that produce psychoactive effects that contribute to nicotine addiction. The only studies that have been conducted on very-low nicotine cigarettes have found that consumers will not maintain smoking these products, but will switch to regular cigarettes. This is not relevant to the mandated reduction of nicotine levels, however, because in that situation, there will be no "regular" cigarettes. There will be no other choice, and it is not clear that smokers will be more likely to quit smoking entirely. Myth #2: The addiction to smoking is solely due to nicotine. As I have revealed over the past months in relation to the apparent effectiveness of electronic cigarettes in suppressing the craving to smoke, high levels of nicotine delivery are not necessary to maintain cigarette addiction. A large component of the addiction is behavioral. Many anti-smoking groups are failing to recognize that smoking addiction is more than just addiction to nicotine. In fact, many electronic cigarette users are successful in quitting smoking even with 0 mg nicotine cartridges. There is substantial scientific evidence to suggest that the behavioral aspects of smoking contribute heavily to the addictiveness of smoking. Replacing the nicotine alone is not sufficient to suppress the craving to smoke. Replacing the behavioral aspects of smoking, in the absence of nicotine, can actually suppress the craving. So it is clear that there are both pharmacologic and behavioral aspects to smoking addiction. Myth #3: Cigarettes would not be smoked if they contained less than 1 mg of nicotine. Many smokers would quit and youth would not initiate smoking. Myths #1 and #2 lead to the conclusion that if only nicotine levels in cigarettes were cut by 90%, cigarettes would no longer be addictive and therefore most smokers would quit and most youth would not start smoking. Hence, Dr. Kessler's estimate of a reduction in smoking-attributable mortality by a whopping 50 to 75% if nicotine levels are lowered. Unfortunately, there is no evidence to support this prediction. A 90% reduction in nicotine levels would most likely not result in a non-addictive product, both because there is no evidence that a level below 1 mg is non-addictive and because the nicotine is just one aspect of the addiction to smoking. What the scientific evidence suggests is the most likely outcome is that cigarette smokers will substantially increase their cigarette consumption in an attempt to try to maintain their current nicotine levels. This increased cigarette consumption will, of course, result in increased disease and deaths -- the exact opposite of what Dr. Kessler promises with his proposed policy. If you addict rats to nicotine by hooking them up to an infusion mechanism by which they can press a lever to administer a nicotine dose, and then you substantially lower the nicotine level, the rats will not cease pressing the lever. Instead, they will start pressing the lever more often, and more frantically. The same behavior occurs when the dose of any addictive drug is lowered. It is unclear what evidence supports the contention that in the face of a uniform reduction in nicotine levels, cigarette smokers will behave in the exact opposite way of what a scientific knowledge of addiction behavior predicts. There is abundant scientific evidence that reductions in nicotine levels are associated with compensation -- the phenomenon by which smokers will increase their cigarette consumption (and puffing intensity) to compensate for lower nicotine delivery. This is one of the major reasons why the low-nicotine cigarette myth is a myth. Let me emphasize that this flawed policy proposal is not Dr. Kessler's fault. It is the result of a flawed law: one that precluded the FDA from eliminating the nicotine in cigarettes. While I am not arguing that elimination of nicotine in cigarettes is a policy that should have been adopted (I have made it clear that I do not favor cigarette ingredient regulation as an appropriate way to tackle the problem at all), the anti-smoking groups should never have agreed to legislation that was intended to lower nicotine levels, but not eliminate the nicotine. Such a policy is exactly what cigarette companies would want because it would increase cigarette consumption as smokers struggle to compensate for the reduced nicotine delivery. Moreover, there is no evidence that lowering the nicotine levels in cigarettes would substantially reduce youth smoking either. The scientific base is simply not existent to support the contention that there is a level below which nicotine would not contribute toward cigarette addiction, or that if there is a level, we know what it is. The biggest tragedy would be if the FDA adopted Dr. Kessler's advice, reduced nicotine levels by 90%, and it turned out that cigarette consumption greatly increased. It would be even worse if such a policy resulted in a lowering of the public's appreciation of the addictive potential of smoking (it most certainly would have that effect). Such an effect would itself increase smoking rates and could perhaps encourage smoking experimentation among youth because they would mistakenly believe that smoking is no longer addictive and so it is less of a danger to experiment. Unfortunately, the FDA tobacco law puts forth a regulatory approach that is misguided and cannot actually achieve a significant reduction in smoking-related mortality. Instead, the FDA should concentrate its resources on the only proven way of substantially reducing smoking: by putting all of its tobacco-related resources into a national anti-smoking media campaign, along the lines of the "truth" campaign. In a press release issued Monday by the American Medical Association (AMA), the leading association of the nation's physicians called on the removal of electronic cigarettes from the market. The AMA adopted a policy in favor of "prohibiting the sale of e-cigarettes that are not FDA approved." Since these products are not currently FDA approved, the policy amounts to an immediate ban on the sale of electronic cigarettes, effectively removing the product from the market. An AMA spokesperson stated: "Because e-cigarettes have not been thoroughly tested, one cannot conclude that they are less harmful or less dangerous than conventional cigarettes." You can't be serious. The American Medical Association does not have enough information to be able to conclude that cigarette smoking, which kills hundreds of thousands of Americans each year, is more dangerous than a device which "delivers nicotine to the user through a vaporized propylene glycol solution" and which has not been shown to cause any disease, much less death among a single American. It doesn't take a rocket physician to be able to figure out that inhaling nicotine plus more than 10,000 chemicals - including 60 carcinogens - is more dangerous than inhaling nicotine without those 10,000 plus chemicals and carcinogens. In fact, the very study to which the AMA press release refers - the FDA laboratory study - confirms that there are only trace levels of carcinogens in electronic cigarette cartridges, comparable to the levels found in nicotine replacement products. If the American Medical Association is not convinced that electronic cigarettes are safer than smoking, then there is no way it should be convinced that the use of nicotine replacement therapy is safer than smoking. After all, the levels of carcinogens in these two types of products are virtually identical. How could it be that nicotine replacement products pose a much lower carcinogenic risk than smoking, while electronic cigarettes don't, if both products contain the same amount of carcinogens? More disturbing than the AMA's apparent scientific incompetence is the fact that it is promoting a policy which would cause severe harm to the public's health. Banning electronic cigarettes would force thousands of vapers who have successfully quit smoking to return to cigarettes. The result? Increased disease and death. Why would the AMA want to do this? Most disturbing, and unethical, is the fact that the American Medical Association - in its press release - fails to disclose its financial conflict of interest: its receipt of funding from pharmaceutical companies which manufacture smoking cessation medications. Banning the sale of electronic cigarettes would benefit two major industries: Big Tobacco and Big Pharma. Every electronic cigarette used is one less cigarette smoked and/or one less sale of a nicotine replacement or other smoking cessation pharmaceutical product. Thus, any financial conflict of interest with pharmaceutical companies must be revealed in a press release which is promoting a ban on the sale of electronic cigarettes. But the AMA has failed to disclose its conflict of interest. By promoting bans on electronic cigarettes, the American Medical Association is doing a huge favor for cigarette companies. Such policies would help protect Big Tobacco profits by ensuring that a product which is being used by many vapers as a very successful strategy for keeping off cigarettes is taken off the market. The rest of the story is that the American Medical Association is apparently more concerned about ideology (and money) than about the lives of smokers. Better that ex-smokers who have quit without the aid of Big Pharma products be forced to return to cigarette smoking than that they remain off cigarettes, but continue to go through a motion that looks like cigarette smoking and which threatens the profits of pharmaceutical companies. A new study published online ahead of print in the Archives of General Psychiatry concludes that secondhand smoke exposure is a cause of mental illness, including depression, psychoactive substance use, schizophrenia, delirium, and mental and behavioral disorder (see: Hamer M, Stamatakis E, Batty GD. Objectively assessed secondhand smoke exposure and mental health in adults. Arch Gen Psychiatry 2010). The study consisted of a cross-sectional and a longitudinal component. In the cross-sectional component, a relationship was found between secondhand smoke exposure and psychological distress. In the prospective component, secondhand smoke exposure at baseline was found to be associated with a higher risk of psychiatric hospital admission at follow-up five years later, while controlling for baseline psychological distress. The sample consisted of 5,560 adult nonsmokers from the Scottish Health Survey. The study concludes that "secondhand smoke influences mental health" and the authors "suggest a causal role of nicotine exposure in mental health." Newspaper headlines widely disseminated to the public the conclusion that secondhand smoke causes mental illness. For example, the headline on Medpage Today read: "Secondhand smoke ups risk of mental illness." Anti-smoking groups have also used the study results to instruct the public that secondhand smoke causes mental illness. For example, ASH Scotland was quoted as stating: "We have known about links between active smoking and mental health problems, but this new research suggests that second-hand smoke is even more harmful than we thought." The rest of the story is that there is a very plausible alternative explanation for the study findings: instead of secondhand smoke causing mental illness, it is quite likely that people who have psychological distress are more likely to expose themselves to secondhand smoke. Think about it: where were the places where people were most likely to be exposed to secondhand smoke in 1998 in Scotland? Secondhand smoke in the conventional workplace was already minimal by then, so the most likely sources of exposure were pubs, restaurants, casinos, and in the home. Are people who frequent pubs and casinos comparable to people who avoid pubs and casinos in terms of their risk of psychological distress? I think not. For example, people often go to pubs or casinos specifically to alleviate psychological distress. In addition, there is no question that people who go often to pubs are more likely to drink alcohol, and probably to use other substances as well. In my view, the cross-sectional study establishes a correlation between secondhand smoke exposure and psychological distress, but it does not imply a causal connection. It is more likely that the direction of causation is the opposite: people with psychological distress are more likely to put themselves in situations where secondhand smoke exposure is higher. The longitudinal study is also severely flawed. The study considers as a potential "effect" of secondhand smoke the diagnosis of psychoactive substance abuse. Yet it does not control for baseline levels of substance abuse. How can you possibly conclude that secondhand smoke exposure causes psychoactive substance abuse among a cohort of nonsmokers if you do not even measure whether they used psychoactive substances at baseline? Other potential "effects" of secondhand smoke included schizophrenia, delirium, and mental and behavioral disorder. There is simply no biologically plausible mechanism to account for a causal relationship between secondhand smoke exposure and any of these disorders among adults. This brings us to another major flaw of the study: the lack of biologic plausibility for the purported causal effect. A conclusion of causality should never be made based on association alone. One also needs to show biologic plausibility. In this case, there is no biologic plausibility. It has not yet even been shown that smoking causes mental illness. In the studies that have associated smoking with depression, for example, the relationship appears to be a reverse one: people who are depressed are more likely to use cigarettes. In addition, people who are depressed are less likely to quit smoking. As the study itself points out, in a large cohort study which found an association between smoking and suicide, the relationship disappeared after controlling for baseline levels of alcohol consumption and mental well-being. The study attempts to put forward a potential mechanism for an effect of secondhand smoke on mental illness, but it is extremely weak. What is the best the study can offer? That's another way of saying: "We have no idea how secondhand smoke could cause mental illness, but we don't want to say that, so instead we're going to invoke the classic 'chronic low-grade inflammation' excuse." While the study is a valuable one because it demonstrates an association between secondhand smoke and mental illness, it crosses the line from solid science to hysteria when it - and groups like ASH Scotland - conclude that the observed relationship is a causal one and when newspaper headlines scare the public into believing that tobacco smoke exposure is a cause of psychiatric disease without sufficient evidence to draw such a conclusion. For some reason, when it comes to the harmful effects of secondhand smoke, all scientific bets are off. You don't need to use the same scientific rigor that we use to study other exposures. Especially since the tobacco companies are no longer monitoring non-supported claims like this one, anti-smoking groups and researchers can get away with a lot more than they used to. This deterioration of the rigor of the science does not benefit the tobacco control movement, however. It harms the movement because it risks losing our credibility and scientific reputation with the public. In a communication sent to its constituents, the Campaign for Tobacco-Free Kids has congratulated itself for what it calls a huge public health victory: the Congressional ban on candy-like flavors in cigarettes, which the Campaign boasts has eliminated the scourge of vanilla, chocolate, and strawberry cigarettes from the market. According to the Campaign: "For years, tobacco companies blatantly targeted kids by using flavors like strawberry, chocolate and vanilla. It was a neopolitan disaster. Today, tobacco companies no longer have this option -- all candy flavors are banned from being used in cigarettes! ... Help celebrate the anniversary of FDA regulation of tobacco by sending a letter to the editor." "Flavors such as chocolate, vanilla, and strawberry are meant to entice and addict children to smoking. Thankfully, candy and fruit flavored cigarettes are now banned from sale." According to the Campaign for Tobacco-Free Kids, the removal of vanilla, chocolate, and strawberry cigarettes from the market was a major public health victory which protected our nation's children from addiction to the neopolitan flavored cigarettes which they were smoking. In fact, the FDA legislation not only failed to remove any neopolitan-flavored cigarettes from the market, it also failed to remove any flavored cigarettes of any kind manufactured by the three major cigarette companies from the market. In other words, not a single cigarette brand manufactured, by Philip Morris, Reynolds American, or Lorillard was removed from the market as a consequence of the FDA legislation's so-called ban on flavored cigarettes. Of course, the one type of flavored cigarette which is smoked by hundreds of thousands of youths - menthol cigarettes - was untouched by the so-called ban on flavored cigarettes. The rest of the story is that the Campaign for Tobacco-Free Kids is full of crap. They are boasting about how effective the flavored cigarette ban was and how it ended the scourge of youth addiction to vanilla, chocolate, and strawberry cigarettes, but what they fail to inform their constituents is that not a single youth was smoking vanilla, chocolate, or strawberry cigarettes prior to the implementation of the FDA tobacco legislation. And the truth of the matter is that the Campaign for Tobacco-Free Kids lobbied against the inclusion of menthol in the Act, thus destroying the only flavoring ban that would actually have done what the Campaign is congratulating itself for having achieved. The Campaign for Tobacco-Free Kids is patting itself on the back for having achieved absolutely nothing. A California state appeals court has overturned a trial court's ruling against Walgreens in its challenge of the constitutionality of a San Francisco city ordinance that bans the sale of tobacco products in pharmacies, but exempts grocery and "big box" stores that contain pharmacies. The trial court found no valid legal basis for the lawsuit, but the appellate court ruled that the ordinance violates the equal protection clauses of the state and federal constitutions. He therefore reinstated the lawsuit. The court ruled that there is no rational basis for prohibiting tobacco sales at pharmacies like Walgreens and CVS that contain pharmacies, but not at grocery stores or box stores that also contain a pharmacy. In order to be consistent with the equal protection clause of the Constitution, there must be a rational basis for the unequal legislative treatment of retail outlets that are similarly situated with respect to the law in question. The court ruled that: "There is no rational basis to believe the supposed implied message conveyed by selling tobacco products at a Walgreens that has a licensed pharmacy in the back of the store is different in any meaningful way from the implied message conveyed by selling such products at a supermarket or big box store that contains a licensed pharmacy. Accordingly, we reverse in part the judgment of the trial court sustaining the City's demurrer without leave to amend." The case now returns to the trial court, having been reinstated on the grounds that Walgreens has a valid legal premise to challenge the ordinance's constitutionality. "Is there a rational basis for letting Safeway sell cigarettes but telling Walgreens that it can't?" "That's the question that a California appellate court is trying to answer in considering the appeal of a lawsuit challenging the constitutionality of a San Francisco law that bans the sale of tobacco products in pharmacies. The law only bans the sale of tobacco in some pharmacies. Those that are part of "box stores" are not included. Thus, although many Safeway supermarkets contain pharmacies, the pharmacies within those stores are still allowed to sell cigarettes. However, a large Walgreens store which may sell may products in addition to pharmaceuticals may not sell tobacco products, even though it offers for sale many food and household items." "If the sale of cigarettes sends a bad message, then why should one Walgreens be allowed to sell cigarettes but not another Walgreens which may be located right down the street? It is very unlikely that the consumer views one Walgreens as having a different mission from another Walgreens, so on what basis is it going to protect the consumer from getting a mixed message by outlawing the sale of cigarettes at one Walgreens but not the other?" "Similarly, there is absolutely no public health rationale for banning the sale of cigarettes in a Walgreens that has a very small pharmacy, but not in a Safeway that may have an extremely large pharmacy. If it sends a mixed message for the Walgreens pharmacy to sell cigarettes at a location where drugs are also being sold, then why does it not also send a mixed message for the Safeway store to sell cigarettes at the same location of an even larger pharmacy?" The appeals court has therefore agreed with my argument. It finds no rational basis to prohibit the sale of tobacco at Walgreens but not at Safeway. It rejected the city's justification for the distinction, which the court decided "does not justify treating stores such as Walgreens differently from general grocery stores and big box stores. " I think there is a larger issue here, beyond merely the legality of the San Francisco ordinance. The larger issue is the hypocrisy and inconsistency in the modern-day tobacco control movement. This irrational law is representative of a larger problem that I have noticed in the tobacco control movement these days: the loss of rationality to its policy positions. Remember, anti-smoking advocates in San Francisco are also pushing for an ordinance to limit the number of stores that can sell tobacco products in San Francisco to 385. Apparently, if 385 stores sell tobacco products in a city, it is perfectly acceptable, but if 386 stores sell tobacco products, then it is an affront to the public's health. The question that arises is this: why is it that the public's health no longer seems to be the driving force behind the tobacco control movement? The movement is no longer standing up for any principle of public health protection. Instead, it is standing up merely for an ideology by which certain actions are allowable and certain actions are not, but the distinction between the two is completely arbitrary. When tobacco companies tell the public that lower yield cigarettes may be safer, they are guilty of fraud. When the anti-smoking groups tell the public the exact same thing, they are "defeating the tobacco companies" and "saving countless lives." When tobacco companies or paid consultants draw conclusions based on studies without a control group, they are undertaking "junk science." When anti-tobacco researchers do the same thing, they are contributing breakthrough findings that must immediately be disseminated through the media. When a university takes money from the tobacco industry, it is to be scorned and not worthy of receiving funding from the American Legacy Foundation. But when Legacy wants to pursue tobacco industry funding to sustain its media campaign, the money suddenly becomes clean. And of course, most recently, when tobacco industry consultants have a conflict of interest, they are to removed from an FDA scientific panel. But when pharmaceutical consultants also have a conflict of interest, they are fine. Apparently, conflicts of interest are defined not by whether there is a conflict, but by whether the cause is a good one or not. If this story teaches us anything, the court's ruling should caution tobacco control advocates that they can no longer go along with this disregard for rationality in policy making. It is time for a return to the basic principles of public health protection. It is time to require of ourselves that we formulate rational, consistent, science- and evidence-based policies that adhere to principle, and not merely to ideology. An article published online ahead of print in BMJ concludes that the smoke-free legislation in England resulted in a 2.4% decline in heart attack admissions during its first 15 months of implementation (see: Sims M, Maxwell R, Bauld L, Gilmore A. Short term impact of smoke-free legislation in England: retrospective analysis of hospital admissions for myocardial infarction BMJ 2010). The study uses "an interrupted time series design with routinely collected hospital episode statistics data" to analyze "admissions from July 2002 to September 2008 (providing five years’ data from before the legislation and 15 months’ data from after) using segmented Poisson regression." It concludes that the legislation resulted in a 2.4% decline in heart attacks, equating to 1200 fewer emergency admissions than would have occurred in the absence of the smoking ban. The paper concludes as follows: "We therefore conclude that the implementation of smoke-free public places is associated with significant reductions in hospital admissions for myocardial infarction even in jurisdictions with pre-existing smoking restrictions." The conclusions of the study have been disseminated widely in the media, such as in a Daily Mail article which states that "The number of heart attacks has fallen dramatically since the smoking ban came in." As you can easily see from the graph, there was no observable change in the trend in heart attacks associated with the smoking ban during its first year. The rate of heart attacks had been falling prior to the ban and continued to fall at exactly the same rate after the ban. If anything, the rate of decline was slightly lower than it had been during the period 2004-2005. Thus, in the two year period preceding the smoking ban, heart attacks fell by an annual average of 4.1%. In the year following the smoking ban, heart attacks fell by 4.3%. Thus, one can see that these data simply do not support the conclusion that the smoking ban led to a decline in heart attacks. When I read the headlines in the newspapers, it then was hard to believe it when I saw the actual data from the study, which simply do not show any change in the trend in heart attacks in England in association with the smoking ban. It's just a straight line that continues down at the same rate as before! What makes the conclusion even less valid, in addition to the fact that it is unsupported by the data presented in the study, is that there is no comparison group in this study! Even if there were a very small increase in the rate of decline in heart attacks in England in 2007-2008, one cannot conclude that it was attributable to the smoking ban unless one can rule out the possibility that this decline was simply a reflection of secular trends in heart attacks occurring elsewhere as well. Without any comparison group, there is no indication of what was going on with heart attack rates elsewhere, so one has no idea whether the rates in England were unique and therefore can be attributed to the smoking ban as opposed to a general trend due to other factors. In fact, with an effect as small as 2.4%, I find it striking that the paper would conclude that such a small effect is due to the smoking ban, rather than to even consider that the reported effect could be due to other changes, such as improved treatment for coronary artery disease and hypertension. While the paper acknowledges that one limitation is the absence of a control population, it completely dismisses this limitation without any reason or justification. If you are going to acknowledge a limitation, you need to explain why that limitation does not threaten the validity of your study's conclusions. Every study has limitations, but the paper must demonstrate why those limitations do not negate the study's ability to draw its conclusion. In this case, the study points out the limitation but then glosses over it, providing the reader with not a single reason to overlook the limitation and accept the study conclusion. We are supposed to, in other words, take it on faith that the observed 2.4% decline in heart attacks observed in England was a unique phenomenon and that the rate of decline in heart attacks elsewhere did not increase at all during the same period. I find that to be too big of a pill to swallow. A conclusion like this needs to be justified based on examining the data, not simply on speculation. Actually, in this case, the paper doesn't even speculate. It just ignores the whole problem. The rest of the story is that once again, we have a study on smoking bans and heart attacks whose conclusion is inconsistent with the very data presented in the paper. For some reason, researchers working on this genre of study are so anxious to find an effect of smoking bans that they appear to have lost their ability to critically analyze actual data and make causal judgments with any kind of rigor. By the way, the reasoning being used in this study is exactly the same as that used by the tobacco companies when they used to argue that smoking bans result in huge declines in restaurant sales. Anti-smoking advocates criticized those studies because they failed to include a control group. Now, the absence of a control group is somehow no longer a problem. When restaurant sales fell in association with a smoking ban, there were lots of alternative explanations that needed to be taken into account. Now, with heart attacks falling in association with a smoking ban, alternative explanations apparently no longer need to be considered. Studies of the effects of interventions that do not include a comparison group of any kind generally represent an extremely weak study design. With an huge effect size, you can sometimes get away without a comparison group because it is implausible that an effect that large represents a common secular trend. 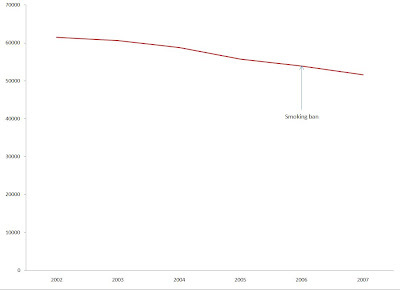 However, in this case, the effect size is miniscule (2.4%) and there is simply no way one can credibly attribute that small an effect to the smoking ban without ruling out the possibility that it is, instead, simply a reflection of a decline in heart attacks that is occurring anyway due to secular trends. Finally, readers should always be skeptical about conclusions that are not consistent with the actual data presented in a paper. 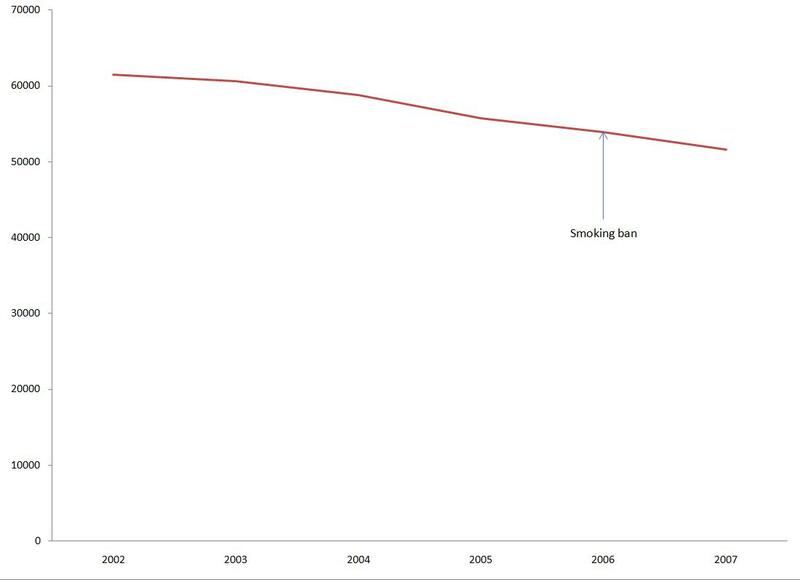 When you have a graph which clearly shows no demonstrable effect of a smoking ban on heart attacks (a.k.a., a straight line), then be wary of a complex statistical analysis that shoots out a specific number. If you can't see the effect in the graph, then it is going to be difficult to argue that any number which comes out of a computer is more believable than your own eyes. Statistical analysis is important as an adjunct to visual inspection of data, especially to help confirm visual impressions, but it is not a substitute for it. (Thanks to Christopher Snowdon for the tip. Read Christopher's excellent analysis of this article over at Velvet Glove Iron Fist). A group of ten individuals with extensive experience over four decades in fighting smoking in the U.S. has announced the formation of an alternative scientific panel on tobacco control aimed at producing more effective ways to reduce the health and economic impact of smoking than the FDA's scientific advisory panel on tobacco. The group – the FDA Tobacco Products Scientific Advisory Shadow Panel – is also unveiling its web site (www.fdashadowpanel.com). “As in parliamentary democracies when the political party that did not prevail in the last election announces a shadow cabinet, the shadow scientific panel on tobacco represents the loyal opposition,” said Alan Blum, MD, Director of the University of Alabama Center for the Study of Tobacco and Society and the panel's co-chair. "Although the shadow panelists may well agree with the FDA panelists on a variety of issues--we are, after all, united in attempting to reduce demand for tobacco---in this instance the loophole-laden FDA bill, its championing by top tobacco manufacturer Philip Morris, the presence of cigarette company representatives on the panel, the initial direction of the new FDA office on tobacco, and the dominant role played by the professional FDA bureaucracy warrants an alternative, uncensored viewpoint on the direction the nation should be taking in regard to tobacco policy." As founder of the first physicians' anti-smoking organization, Doctors Ought to Care (DOC), in 1977, Dr. Blum has been continuously involved in tobacco control for more than 30 years. “The FDA Shadow Panel will issue periodic recommendations for tobacco policy, mirroring the Tobacco Products Scientific Advisory Committee's agenda and actions, but providing an alternative perspective that is evidence-based and free from political, corporate, or economic influence,” said Michael Siegel, MD, MPH, Professor of Community Health Sciences at the Boston University School of Public Health and co-chair of the FDA Shadow Panel. In contrast to the actual FDA Tobacco Products Scientific Advisory Committee, which includes three tobacco industry representatives, a committee member who has taken tobacco money in the past, and four committee members who are either pharmaceutical consultants or have taken money from pharmaceutical companies, one Shadow Panel member (Dr. Blum) has received honoraria from pharmaceutical companies for presenting a handful of talks to medical audiences on smoking. The shadow panel also launched its website, www.fdashadowpanel.com, written by the panel members, each of whom has extensive experience over many years in addressing different aspects of the smoking pandemic. The website will be open for public comment and debate. Several of the shadow panelists have been critical of the early efforts and priorities of the FDA agency on tobacco, which they see as misguided. For instance, Dr. Siegel has raised questions about the FDA's aggressive opposition to the electronic cigarette in contrast to its silence on Marlboro and other popular cigarette brands which have been recognized as lethal since the 1964 Surgeon General's report and yet remain unchallenged on the marketplace. Dr. Siegel and Dr. Blum have also pointed to conflicts of interest of panel members. The chair of the panel, Dr. Jonathan Samet, has in the past aided the tobacco industry in setting the agenda for research on secondhand smoke. Other panelists have competing interests by currently receiving pharmaceutical funding. The pharmaceutical industry stands to gain if the tobacco industry's so-called reduced harm nicotine products, such as non-combustible smokeless tobacco, are not permitted to compete with its higher-priced medications as aids in smoking cessation. For Dr. Blum, who testified in opposition to the FDA bill at both the Senate and House of Representatives hearings, the FDA has not been granted sufficient power by Congress to seriously hamper cigarette sales. He finds it absurd that the same agency charged with regulating cancer drugs, which the FDA can pull off the market if found to have inordinate toxic side effects, now has oversight over cigarettes, which it cannot remove from the market. “Congress could have banned menthol in the bill, for instance,” notes Blum, “as it was pressured to do by former Health and Human Services Secretary Dr. Louis Sullivan and numerous African-American leaders and organizations who accuse cigarette manufacturers of decades of deception in targeting menthol brands to African-Americans. But Democratic proponents of the bill kowtowed to Philip Morris in order to get the bill passed. Now the FDA has dug itself a bottomless hole by having to scratch out a scientific case against menthol argument." Dr. Blum would like to see the FDA issue and publicize a major statement informing the public that filtered cigarettes---now consumed by more than 95% of all smokers in the false belief that they are safe---do not confer any reduction of health risk whatsoever and represent consumer fraud. "Nothing would debunk the lies of the tobacco industry better than that," he says. He would also like the FDA to bar tobacco companies from funding university-based research and claiming to be part of the solution and not the source of the problem. "The commingling of money from the tobacco industry with taxpayer-supported funding from the National Institutes of Health is obscene and needs to be stopped once and for all. It is particularly odious when the tobacco industry continues to recruit students on college campuses to become cigarette sales managers and continues to deny in court that its products cause lung cancer, emphysema, and heart disease." John Polito, the founder and director of WhyQuit.com, argues that the FDA should issue regulations requiring that tobacco products may only be sold at locations to which youth are prohibited from entering. Founder, Missouri GASP (Group Against Smoking Pollution) Inc.
A number of health groups - such as the Campaign for Tobacco-Free Kids - contend that the new FDA tobacco law will save lives by allowing the FDA to mandate reductions in certain constituents of tobacco smoke. In fact, the basic regulatory structure of the Family Smoking Prevention and Tobacco Control Act is the task - given to the FDA - of requiring safer cigarettes by mandating the reduction or elimination of certain chemicals in cigarette smoke. While that might sound beneficial for the public's health at first glance, a more careful analysis of the science reveals that the idea is actually an absurd one that makes no sense and will - rather than protect public health - simply transfer the fraudulent deception of American consumers from the tobacco industry over to the federal government. 1. We currently have no idea what constituents in cigarette smoke, at what levels and combinations, result in the observed health effects of smoking. Without knowing the specific constituents that are responsible for the harmful effects of smoking, there is simply no way that the FDA can produce a cigarette that it knows will be safer. 2. We have only identified 4,000 of what may be as many as 100,000 chemicals in cigarette smoke. Thus, there are as many as 96,000 unknown chemicals. With 96,000 unknown chemicals in tobacco smoke, it is clear that we cannot determine the risk of cigarettes simply by knowing the levels of the 4,000 known chemicals. 3. Research has demonstrated that risk analysis of the known constituents in cigarette smoke explains less than 4% of observed lung cancer risk. In other words, even if all identified carcinogens were removed from cigarettes, there is no evidence that the incidence of lung cancer among smokers would be reduced. An article published in the March 2007 issue of Cancer Epidemiology, Biomarkers & Prevention concludes that even if all currently known and measured carcinogens in tobacco smoke were completely removed, there would be little reason to believe that there would be any observable reduction in smoking-related cancers (see: Pankow JF, Watanabe KH, Toccalino PL, Luo W, Austin DF. Calculated cancer risks for conventional and 'potentially reduced exposure product' cigarettes. Cancer Epidemiology, Biomarkers & Prevention 2007; 16:584-592). This is a critically important study and it has vital implications for the consideration of the FDA tobacco law. Specifically, the study demonstrates the complete folly of the regulatory approach and the ridiculous nature of the claims being made by the Campaign for Tobacco-Free Kids, American Medical Association, and other organizations that the legislation is going to "save countless lives." I don't really understand why it is that if the tobacco companies make such baseless, undocumented, and deceptive claims, it represents fraud and engenders attacks on the companies for their unscrupulous actions, but when anti-smoking groups make even more baseless, undocumented, and deceptive claims, it is now magically acceptable because we are working towards an allegedly noble cause. The FDA tobacco legislation is really a mechanism to transfer the deception about low-yield cigarettes from the tobacco companies to the government. It takes the tobacco companies off the hook, allowing them to smile all the way to the bank as the very low-yield health claims they have been found guilty of making are now made by the federal government. And to boot, the companies no longer will have to face a liability risk for making such undocumented claims. The government is going to be doing all the dirty work for them. What a brilliant scheme! The rest of the story is that there is absolutely no evidence to support the law supporters' contention that by reducing or eliminating specific constituents of the smoke, we will produce a safer cigarette that will save countless lives, millions of lives, or even any lives. In fact, the science shows that even if every known carcinogen in cigarettes were removed, we'd be in no position to be confident that the actual cancer risk of smoking had been reduced. And you can be sure that the FDA is not going to enact regulations that require the removal of every known carcinogen from cigarettes! Moreover, the only way to know whether a reduction in specific constituents would reduce the risks of smoking would be to mandate those changes and then conduct long-term epidemiologic studies. In other words, smokers would have to be used as guinea pigs. The FDA would have to set so-called "safety standards" without knowing whether those standards actually reduce the product's risk. It would take years to find out. In the mean time, smokers would be misled into believing that by virtue of the FDA's promulgation of a "safety standard," the product has been made safer. This will certainly undermine the public's appreciation of the hazards of smoking and will cause many smokers who would otherwise have quit entirely to instead continue to smoke, thinking that the FDA-mandated changes to cigarettes have made them safer. The end result will likely be harm to the public's health, due to an increase in smoking caused by deterrence of smoking cessation because of the perception that cigarettes are now safer. In other words, it will be the "low-tar" fiasco all over again, except now it will be the federal government perpetrating this fraud instead of the tobacco companies. It is critically important to understand that there is no way of determining cigarette risk based solely on studying the product in the laboratory. Epidemiologic studies of the actual use of the product in the population is necessary to determine whether a change in the constituents of cigarettes will lessen their health risks. To repeat the important conclusion of Pankow et al. : "The current inability to use toxicant-specific methods to account for the observed cancer risks of smoking carries an important implication for PREP cigarettes. Namely, all expressed and implied promises of 'reduced harm' ... of PREPs (including ostensible PREPs) must be viewed as speculative and unverified. Indeed, because does considerations for known tobacco smoke lung carcinogens account for <4% of the lung cancer risk of conventional cigarettes as they are smoked by North American populations, then lowered levels of these toxicants in PREPs still leave PREPs in the possible position of being as harmful as conventional cigarettes." This means that the FDA has been put in the absurd position of being asked to promulgate "tobacco product safety standards" for which it will have no way of knowing whether they will improve, have no effect on, or harm human health. This is an untenable to position to be in, and it needs to be rejected outright. The FDA tobacco law has been enacted, but there is no requirement that the FDA adopt any "product safety standards." Instead, I recommend that the FDA take an entirely different approach, and devote all of its time and resources not to regulating the product, but to trying to decrease the demand for the product and actually make a dent in smoking rates by funding anti-smoking education and prevention programs, including media campaigns, throughout the country. Unlike product regulation, which has no science to back it up, the use of media campaigns to reduce smoking is supported by solid scientific evidence. The rest of the story is that in their zeal to put a feather in their cap by being able to claim that they achieved FDA regulation of tobacco products, the major anti-smoking and health groups actually deceived the public about the potential health benefits of lower-yield cigarettes to a greater degree than anything the tobacco companies have ever done. Frankly, the tobacco companies wouldn't even dream of deceiving the public to this extent. They remained somewhat subtle in their deception, by merely implying that there is some health value to reduced yield cigarettes. I can only imagine the scorn and ridicule the companies would have received had they claimed that their lower-yield cigarettes were going to save countless lives.